Reflections of hiking the Occoneechee Mountain Loop: I woke up early on a Saturday morning and headed to the Occoneechee Mountain State Natural Area in Hillsborough, NC for a guided hike tour. 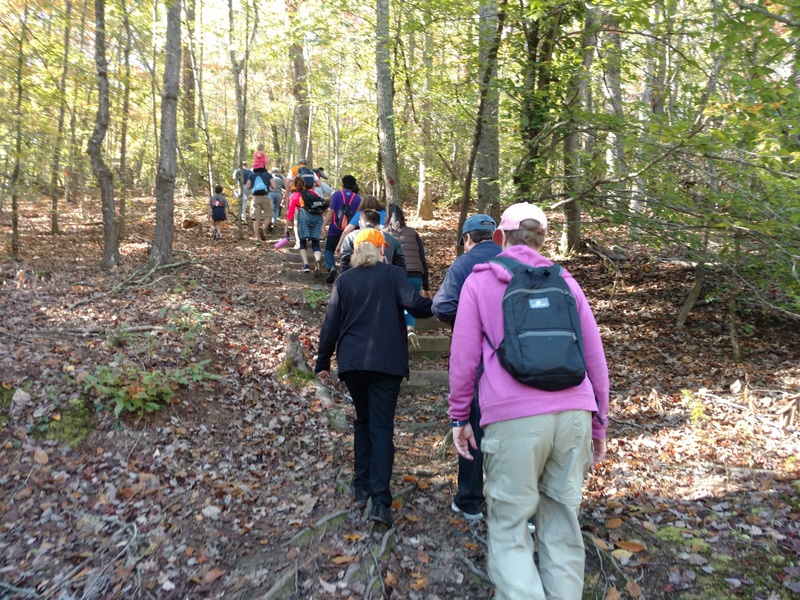 There was a good size group that came together for the initiative that Blue Cross and Blue Shield of North Carolina (BCBSNC) is promoting, Hike NC!. Hike NC! aims to make hiking an easier more approachable experience for North Carolinians across the state. BCBSNC wants North Carolinians to get outside during the Fall Season and explore the local NC State Parks. 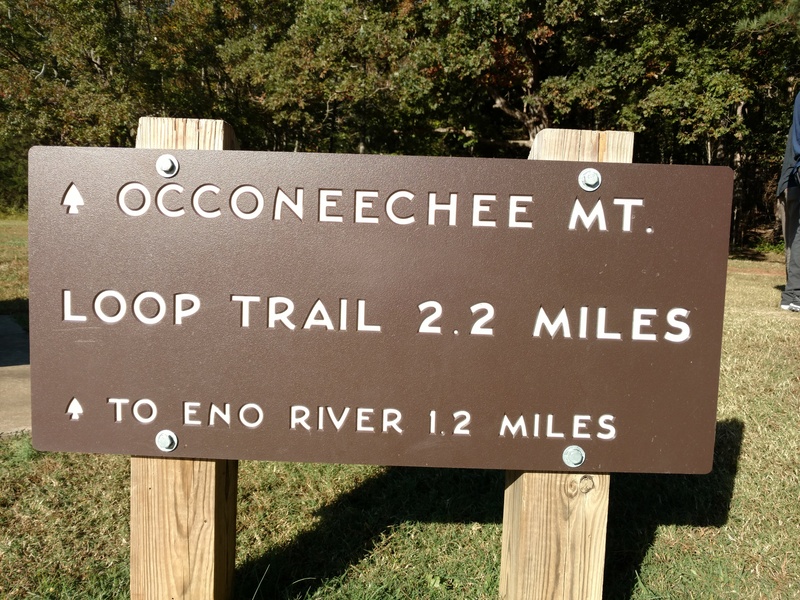 My daughter was my partner in hike and we set off to explore the natural beauty that the Occoneechee Mountain Loop had to offer. Park Ranger Christopher was a great guide and this particular hike was special for a few reasons. 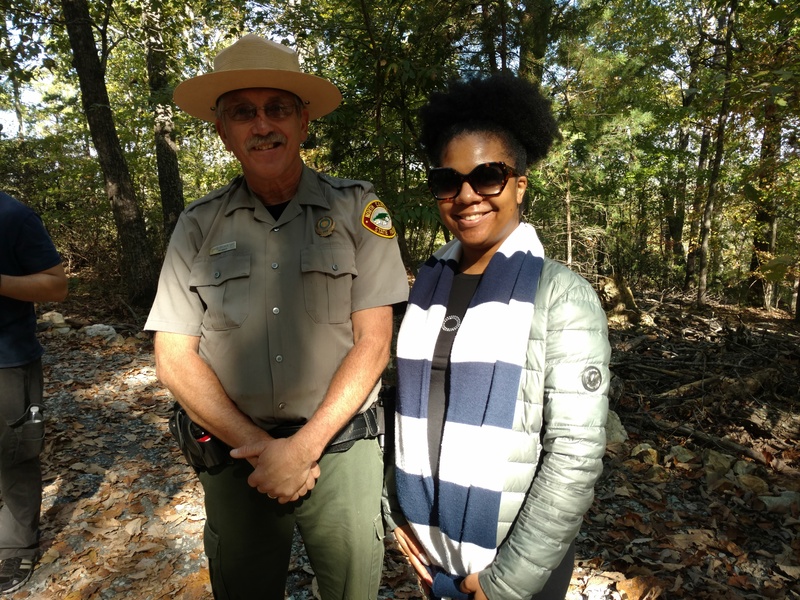 After thirteen years of dedicated service as Park Ranger at the Occoneechee Mountain State Natural Area, he is retiring and it was his last official guided tour hike! Park Ranger Christopher was passionate as he guided us through the trails often stopping to tell stories about a particular spot we were in and what happened once upon a time. The area is beautiful and offers about three miles of trails to explore. My favorite spot was the Overlook Trail. The overlook Trail sits 850 ft. above the ground and when you get there you feel a sense of accomplishment. I know I did! It was like… I made it to the top! Then you have a moment to look out at all the beautiful scenery overlooking the Eno River in the distance. I definitely think you need to be equipped with the right tools for hiking so that you can have a good experience. 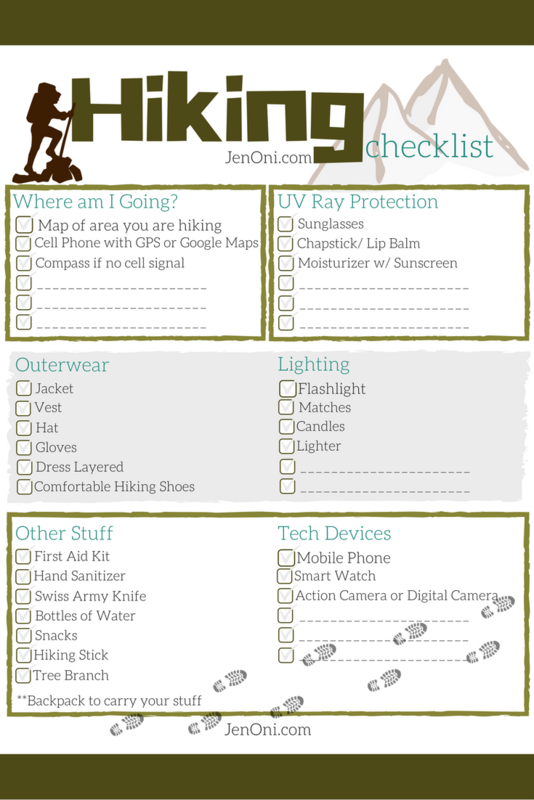 I will share a checklist PDF (print friendly) with you of things to pack when hiking. Bonus: We had cake and beverages waiting for us when we got to overlook trail to celebrate Ranger Christopher’s last hoorah and 100 years of North Carolina State Parks. Each week until December 10th, 2016 BCBSNC is giving away $25.00 gift cards donated by Great Outdoor Provision Co. to use at any of the nine special outdoor retail locations. One lucky hiker will win the grand prize which consists of: $2,500 gift card to the Biltmore Estates in the scenic North Carolina Mountains and a one year membership to the North Carolina Arboretum! EVERYONE who registers and hikes has a chance to win! Please note that each entrant must be 18 years of age or older and a legal resident of North Carolina at the time of entry. 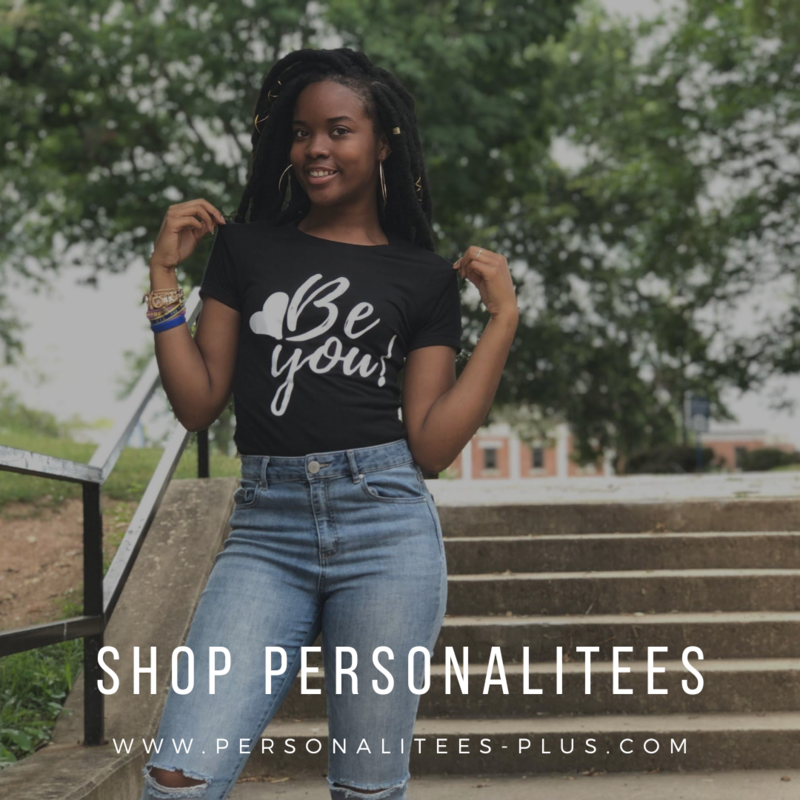 If you love Instagram as much as I do, BCBSNC is having a contest over there too! It’s so easy to enter and you have the opportunity to win a GoPro Camera! Capture Mother Nature’s beauty on your next hike for a chance to win a GoPro! 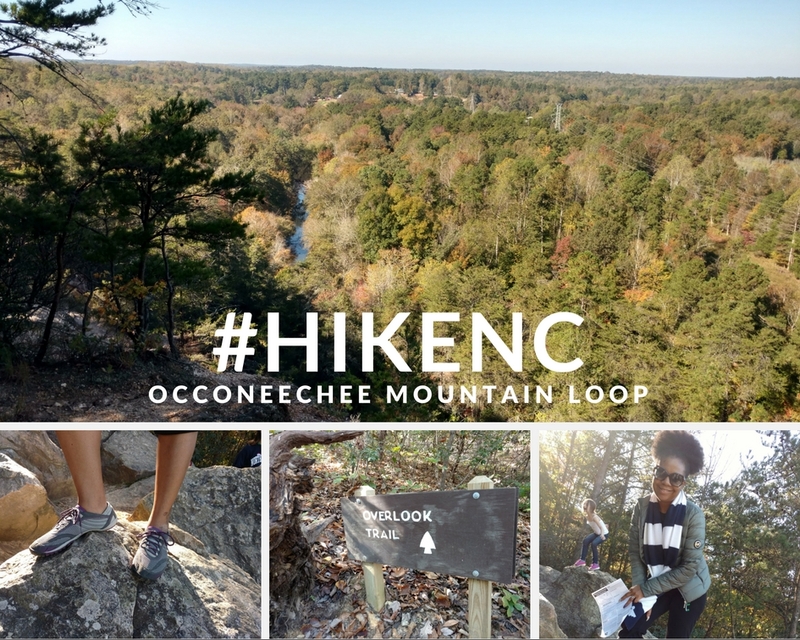 Post your photo to Instagram, use #HikeNCGiveaway & tag @BCBSNC in the caption. Contest Ends Nov. 10, 2016. 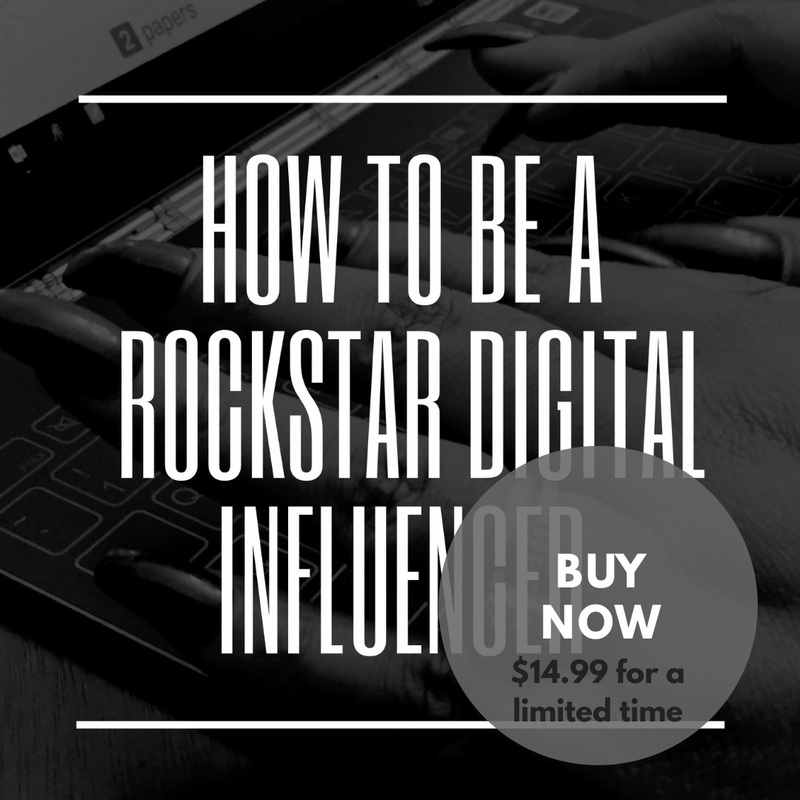 These are some great contests with awesome prizes! 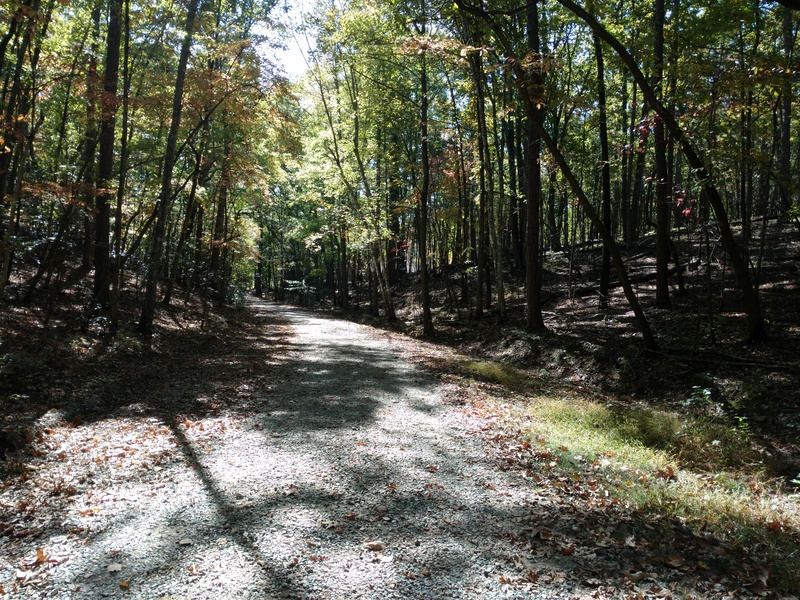 Don’t you just want to schedule a hike and take advantage of this beautiful fall weather? Fun Fact: The Occoneechee Mountain was owned by the Cates Family and they lived on it for over 100 years before the NC Division of Parks and Recreation purchased it in December 1997. You enter the property using Virginia Cates Road. Visit the Go Hike NC website for more information and to schedule your next hike! I can’t wait to see your pictures! I was invited to participate in Hike NC! by Blue Cross and Blue Shield of North Carolina and received a travel voucher for my participation. All opinions are my own. Hike NC! is the next step in BCBSNC’s Get Outside North Carolina (GO NC!) community program, which was created in 2012 to encourage North Carolinians to get outside and get active.